The 2018 Research Conference on Diversity & Inclusion will take place on March 29, 2018 at the CUNY Graduate Center in New York. With 24 colleges and nearly 300,000 students, CUNY is the largest urban school system and has the most diverse student body in the country. The first ever to focus on Diversity and Inclusion (D&amp;I) research, the Conference will showcase research from all across CUNY, create opportunities for collaboration, and provide recruiting opportunities through a day-long job fair. Registration is free for all members of the CUNY community. Cultural Diversity at Work Archive — An Extraordinary Resource! The Cultural Diversity at Work (CDW) Archive is an online database of almost 1,500 articles, tools and resources on diversity, inclusion and cultural differences. You can use the Archive to increase cultural intelligence—for individuals, teams, and organizations! With cultural intelligence, you have a path toward inclusion! 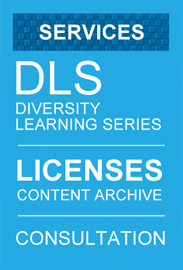 The Archive is loaded with best practices and innovative solutions. Learn more about the Archive. Purchase a Content License for your organization.